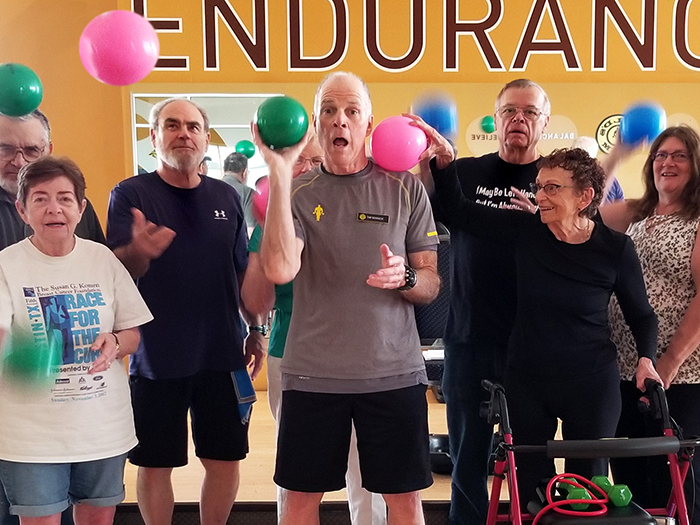 Tim Minnick went from a corporate desk jockey to a health and fitness advocate for seniors everywhere. Here’s how he seized his second chance—and you can too. Two years ago, Tim Minnick walked into his local Gold’s Gym expecting the worst. It isn’t that he was prepared to find faulty equipment or pesky machine hoggers. In fact, he wasn’t even there to work out at all. Instead, Tim had a big interview. And he didn’t like his odds of landing the job. The Gold’s in Austin, Texas, was searching for a new trainer to join the team, and Tim was an unconventional candidate to fill the position. Gyms don’t usually hire retired insurance agents, he reasoned. Especially not if they’re in their early 70s. Indeed, Tim walked out of the fitness center that day with a new job—and a surprising new direction. 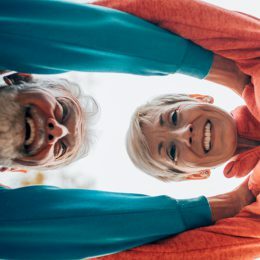 After helping people and companies choose benefit plans and policies for four decades, now it was his responsibility to help a new set of clients—specifically people over the age of 55—take care of their bodies and live their best lives. He was up to the task. So, how did Tim go from a longtime corporate desk jockey to a health and fitness advocate for seniors everywhere? He seized his second chance—and so can you. Tim breezes through the details of the first part of his life as if he’s scrolling through his personal Wikipedia page: Born in Houston. Grew up in San Antonio. Studied and played baseball at Texas A&M University. Spent a brief stint in the Air Force after college. Married his wife, Liz, and settled in Austin, where they raised three kids. Fell into insurance by chance but was skilled enough to start his own agency and run it for more than 30 years. It was a nice life. It was simple. Tim and Liz, a teacher, “started with next to nothing” when they got hitched in 1960, he says. But as the decades went on and their family and success grew, they enjoyed the many fruits of their labor. They were both diehard sports fans who rooted for their beloved A&M Aggies, and Liz knew “more about football than 90 percent of guys,” he says. 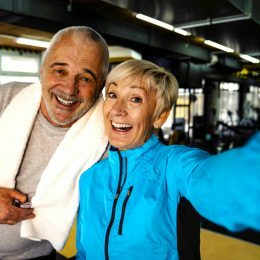 They loved competing with friends in various activities, visiting their grandkids, and even sweating together—she was an early proponent of Jazzercise and eventually hooked him too. In 1994, Liz battled breast cancer and beat it. But in 2006, it returned. This time the disease moved rapidly, and doctors told her she didn’t have much time to live. Tim became her caretaker and prayed for a miracle. “Usually, though, it just doesn’t work like that,” he says. In December 2007, a year and a half after her diagnosis, Liz passed away. While Tim attempted to stay mentally and physically fit during Liz’s fight, he felt himself sliding. Despite engaging in regular strength workouts, Tim put on 25 pounds and fell into a depression. Three years later, Tim remarried, but the union was short-lived. Still reeling with grief from Liz’s death and dealing with a fresh divorce—not to mention a “business that went down the tubes at the exact same time”—Tim was struggling more than ever before. So, he decided to formulate a plan for refining his mind, body, and purpose. It wasn’t long until he found a way to tackle all three. Tim always considered himself to be a fit person, but he didn’t know much when it came to the actual field of fitness. Or nutrition, for that matter. So he started studying up, devouring as much scientific information as he could find. 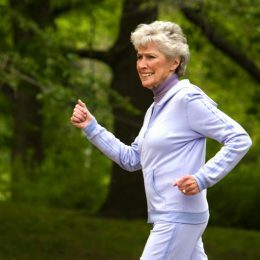 “I realized that your age makes such a difference in how your body metabolizes food and builds muscle,” he says. Next, Tim crammed for his personal trainer certification, administered by the National Academy of Sports Medicine. “It was hard,” he admits, “but I learned a heck of a lot. 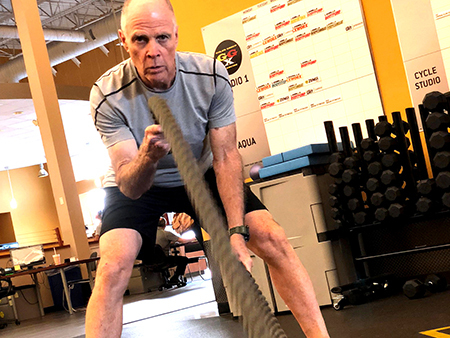 If you’re going to be in this business, you have to learn constantly.” No kidding: Tim has also since earned certifications in senior fitness, golf fitness, and corrective exercise. 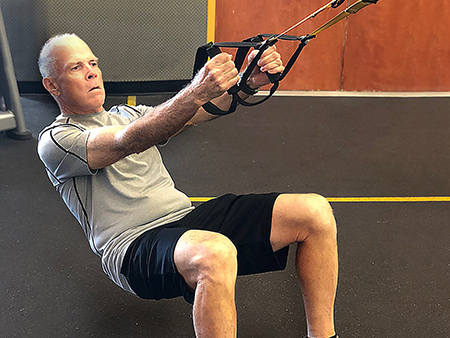 Armed with his newfound knowledge, Tim scored the Gold’s gig and almost immediately carved out a niche as the gym’s go-to trainer for older clients. This principle guides Tim in his training sessions and especially in his new SilverSneakers class, which he brought to Gold’s in July 2018 and has already grown from six students to 15. In his time as a trainer and instructor, he has seen his clients make huge strides. He specifically shouts out Regina, a 60-year-old woman who has battled a brain tumor and stroke, among other ailments.